Hey folks, Valkor here and I am back fresh from my trip at 2005 Winter CES (Consumer Electronics Show) the place where the big names in electronics such as Sony, Apple, Microsoft, Philips (to name a few), and tons of retailers and press all converging in one place to check out the latest technologies. 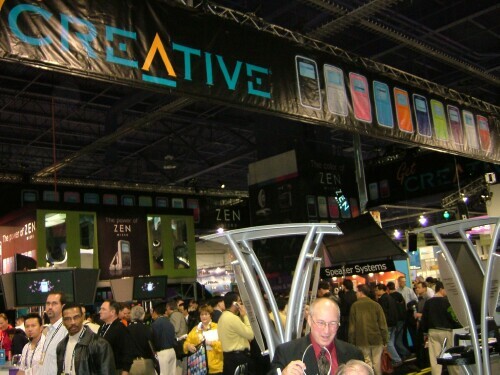 This isn’t my first time at CES having been at 2001; however this is the first time going under the TOV name, so I am very glad to have the opportunity. Overall I must say this was a blast to attend, it was very exciting, very informative, and very exhilarating trying out all the new products that will be in our homes in the near and far future. Now I will try to keep things as brief as possible, but hopefully not too brief. Now this isn’t the actual day one for the show. I actually got there the night of so I missed the first day. But this is the first day that I attended and would you believe it actually snowed in Vegas? As I made my way to the Monorail (which I found out had just opened the day before), snow was actually falling from the sky. 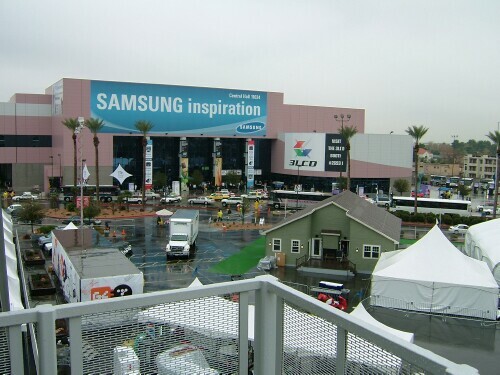 Plus it was pretty cold and wet, however that didn’t deter me from my mission: To get info on hot new products. This is just a brief rundown of some of the companies whose booths I visited; there are still two more days ahead and many more companies to visit. So in no particular order we begin. With Tom Arnold and Jackie Chan in tow, Xavix whipped out an impressive display of their wireless gaming product. Currently out on the market you have many different sports titles to choose from such as Baseball, Tennis, Bowling, Golf, and even Bass Fishing. I didn’t get to see Chan, barely got an image of Arnold, but I did try out Xavix’s products and once you get adjusted to it, it’s a lot of fun. This is something that has been tried before, but never have I seen or felt anything like this. 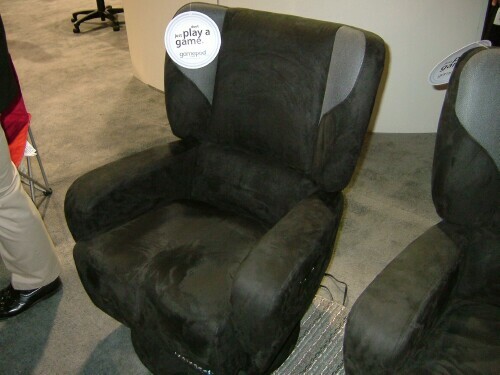 Its Gamepod’s media chair. Be prepared to be totally immersed in gaming and with movies. First thing I noticed was how comfy the chair was, dude I swear if they make a barcalounger chair, I will so buy it! It’s got two speakers behind you and a vibrating bottom so be prepared to hear and feel every hit, every bump, every laser blast and every explosion happening on screen. It also works well with DVD’s Mp3’s, your TV and even your gameboy… but who wants to be immersed in the teeny sounds of a gameboy?? Other than that, the chair is a solid product and a good entry in the media field. I actually have a CyberHome portable DVD player sitting in the Valcave. It’s a pretty good player, with excellent video and sound, but weak in battery life, but that can be said for most portable DVD players. What caught my eye was the portable MINI DVD players. Marketed strictly for kids, the mini player comes in a wide variety of colors and plays 3 inch mini DVD’s on a small screen with a 4. At the booth were a number of Warner brothers titles in 3 inch format that can be used with the player, but for anyone who is looking for a serious player move along there is nothing to see here. But for the kiddies, this could work. I was stuck at the Optoma booth for quite a spell, mostly because their DLP projectors they had showing were amazing. Beautiful picture coming from such a small box, how do these guys do it? The demo they showed was the Charlie’s Angel 2 demo and while a better film than the first, they could have chosen a film whose cinematography would have better showed off what the product can really do. But hey either was I was impressed. TOV hopes to really give this baby a run in the future. Speaking of projectors, you want to be truly amazed? You want to be totally blown away? You want your eyes ripped out of their sockets because they cannot believe what they are seeing? Check out 3 LCD’s latest 1080 p projector. With such a high resolution the images you see are so sharp, so clear, and so amazingly unbelievable, that you really truly won’t believe your eyes. However what they showed was their demo made just for their projector (and HD-TV) but we saw no film that utilizes the actual product. I know you wanna put your best face forward, but a trailer or something would have been nice. But I don’t hate on it, I loved the DLP projector and I wanna own one in the future. Great Job 3 LCD. If you’re serious when it comes to your computing hardware needs, then you will know the name Creative very well. And if you don’t know, then Creative is a good way to start. Creative has always been a name meaning “quality” especially with their soundcards. (I have the Soundblaster Audigy running all the sound capabilities of the Val-cave). They also make webcams, speakers, and now you can ad mp3 and media players to the mix. I got the chance to play with the Zen micro, which goes up directly to the ipod mini but has one extra gig more (5 gigs total) and 2 extra hours of battery life (12 hours total). And don’t let the size fool you, it packs quite a punch, definitely easy to use, and has great sound from its headphones. I mean damn, it should have great sound, it’s from Freakin Creative. Great sound is their specialty. After playing with one for just a few moments I was hooked and ended up purchasing one on site. Look for my review soon. Creative also had a product called Prodikeys. Basically, this is a keyboard, with a piano keyboard within. This is more or less a gimmicky item, not many users out there will want a piano with their keypad. But I am sure there’s someone out there who will want one. What an impressive showing AMD had, displaying the power behind 64 bit processors. 64 bit computers are the shiz especially when it comes to details. They were showing off a patched version of Shadow Recon that could only run on a 64 bit computer and all I can say is… wow!! The added touches to the environment and realistic lighting and showdown effect really do immerse you in the game. But I should also point out that the demo was actually a video doing side by side comparisons between 32 and 64 bit, but I still give AMD props, I have used computers running their processors so I have faith in them and what it can do. 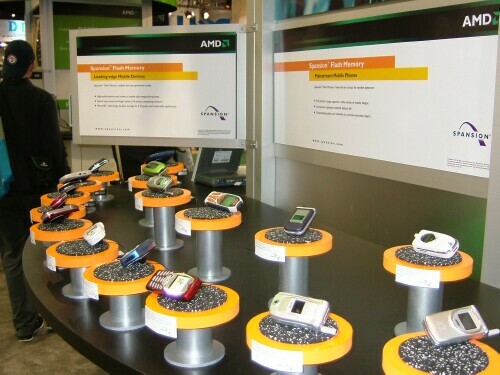 They were also showing off their spansion flash memory line and what it can do with cell phones and the like. There were a host of other booths that I visited that day, but the ones above were the ones I spent the most time with. However just because my visit was brief at other booths, doesn’t mean they don’t deserve mention. Let’s give props to Voom and true power of High Def, they are the only company that offers the most HD channels (thus far), Vonage and their broadband phone service, Earglove maker of cell phone accessories, My Light and their cute clip lights, Pengo and their hamburger style CD holder (gotta get one of those for the trips), THX and Dolby for OUTSTANDING sound exhibits, Freescale and their wireless HD technology, and last but certainly not least JUICE the rechargeable alkaline battery (gonna buy a pack and see just what it can do). Overall the first day was a success. Day two Valkor is taking on the big boys. Watch out Sony, JVC, Microsoft and the like, TOV is comin’ at ya.